12 Premium Rio Red, 80 Centimeter Long Stemmed Roses arranged in a vase with assorted greens and Baby's Breath. 18 Premium Rio Red, 80 Centimeter Long Stemmed Roses arranged in a vase with assorted greens and Baby's Breath. 24 Premium Rio Red, 80 Centimeter Long Stemmed Roses arranged in a vase with assorted greens and Baby's Breath. 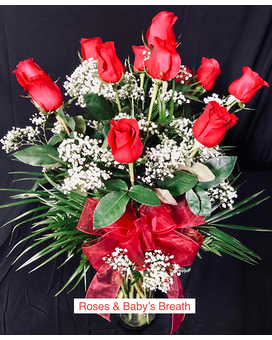 36 Premium Rio Red, 80 Centimeter Long Stemmed Roses arranged in a vase with assorted greens and Baby's Breath.